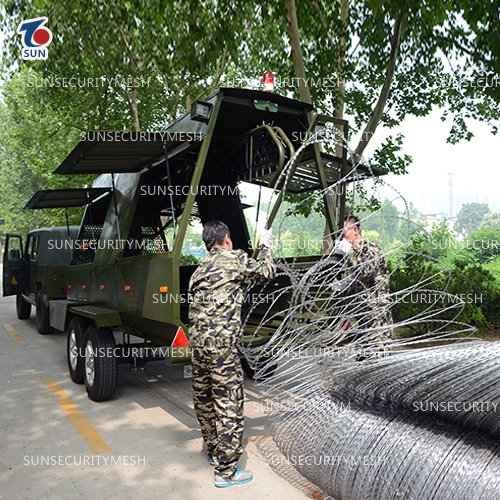 Military System rapid deploy mobile barrier - Hebei Zhengyang Wire Mesh Products Co., Ltd.
army uses. This mobile barrier is composed with three parts: Barbed wire, the trailers, the wires and parts. 4. The trailer designed to carry 3 rolls of barbed wires placed longitudinally inside special pipes to carry the wires without overlapping each other. 5. The height between the Trailer and the ground is 30 cm. 6. The axes , doors and the sections are made of steel processed against rust and aluminum. 7. The trailer Provided with a tool to withdraw from the front, extra chains and another tool to withdraw stored in the tool box. 8. Load capacity 3 TONS. 9. Total 5 tires. And 4 of them on the sides and one spare tire Wight 30 pound. Tire Wight 7 KG . 10.Installing front tire to facilitates the installation and downloading of the trailer. 11. Brake lights , signals and electricity link with car battery according to international traffic system. 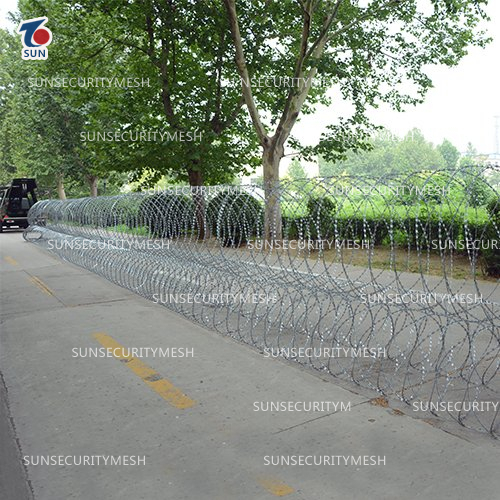 Applications include crowd control and riot prevention,prisoner short term detention, site security, augmented fence perimeter security, and quick site security protection.